I’ve been reading a number of reports about the future direction for Rolls-Royce. As many readers will know they are owned by BMW – whilst their original partners in crime, Bentley, are owned by the competition: VW. From a joint platform they have really diverged with the VW Group giving Bentley room to expand and importantly, technology, to produce some amazing vehicles. Remember what’s in that group: VW, Audi, Porsche, Lamborghini, Ducati, Bugatti and several brands that pay the bills! Going back in history, VW actually bought Rolls-Royce and Bentley from Vickers. Vickers had an arrangement with BMW to supply engines and were the prime target for the purchase but VW had deeper pockets. This lead to a problem – the Rolls-Royce name was owned by another entity: Rolls-Royce PLC. This entity licensed the name to BMW and so an agreement was reached to split the factories with VW and BMW carving up the old company. Rolls-Royce left Crewe and created a new factory in Goodwood, near the famous racing circuit. In 2009, Rolls-Royce introduced the Ghost which was built around BMW’s V12 and apparently sourced 20% of its parts from BMW. 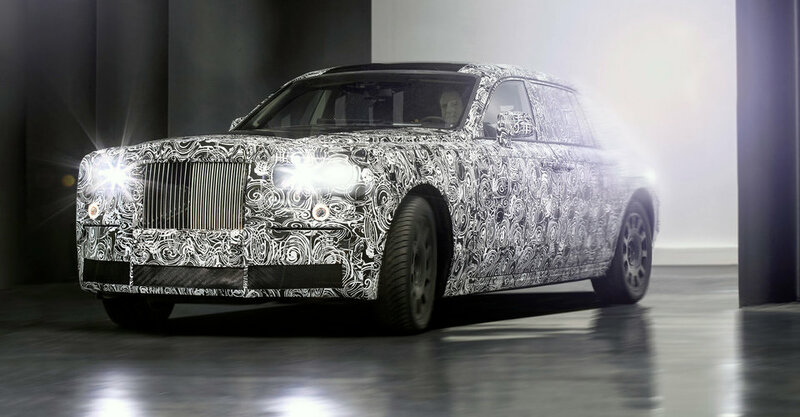 Unlike big brother, The Phantom, that was sculpted in aluminium, the Ghost was made of steel. It was a “cheaper” model and Rolls-Royce had moved a step forward using well developed components and engines to expand their range and profitability. A couple of years ago, the company took another step forward by announcing that they would redevelop the architecture of their cars bringing in an aluminium space-frame. Originally it was mooted for a new crossover vehicle – competing with VW’s Bentley and Lamborghini with their high-end SUVs. In recent reports it seems that the architecture will spread to all vehicles by 2018. Pundits are already suggesting the crossover will be the most expensive SUV on the market! Aluminium is getting more common with manufacturers, it is an important material for lightweight manufacturing and provides a foundation for better fuel economy and performance. Space-frames are another important design element used in race cars for decades. They are strong and light as well, and provide several links back to their heritage: aluminium was the only metal of choice for decades with craftsmen meticulously hand forming the bodywork and space-frames originated in the aircraft industry – where Rolls-Royce PLC still excel at building engines. At the same time, Rolls-Royce is developing new suspension and all-wheel-drive systems for the SUV and I’m sure that some of this find its way into other models and even high-end BMWs – some reports even suggest that a new X7 will use some shared technology. Development cars are under test in readiness for a formal launch in a couple of years. On January 4th, the company formally opened its new technology centre on the south coast of the UK and has been expanding its workforce through new hires and apprenticeships. Today, the company makes nearly 4,000 units a year and sharing the new space-frame will ensure that all new models will benefit from the development – and per unit costs of the development reduced. What’s great about all the reports is that it seems that BMW are giving Rolls-Royce as much freedom as Bentley appear to have with VW.